We are always here to help with advice and counsel when you need it most. Honest & clear guidance for all the important stages of your life. We are experts in managing and resolving small and large commercial disputes in Australia. Clear advice and guidance for builders, developers & home owners along the entire construction process. Whether buying or selling, we're here to ensure your business dream doesn't become a nightmare. Helping you and your family through difficult times with clear guidance and expert advice. Even if you are not planning to divorce, documenting separation can save time and stress later on. In case things don't work out, we can help you protect income and assets acquired during the marriage. Estate Planning is money well spent to give you peace of mind and save money and stress later on. Having a Will and Powers of Attorney in place gives you peace of mind that your wishes will be carried out. Helping your family and loved ones through the complex estate process, with compassion and expert guidance. We protect your property every step of the way. From transactions to risks and disputes. Clear advice and guidance for some of the largest transactions you will enter into during your life. We have the practical experience and knowledge to protect your assets every step of the way. Going To Court? This is the Ultimate Guide to a Good Result. 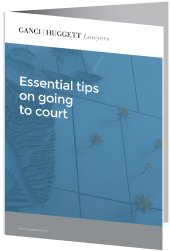 Going to court is never fun, but if you follow these simple tips your will maximise the chance of things going in your favour. We are a private boutique law firm based in the Melbourne CBD. We are different from most city law firms because we pride ourselves on high levels of personal service, value and above all else, a focus on the priorities for our clients.The majority of our clients come to us at a very important stage in their life; buying their first major investment, or encountering their first serious legal issue. We believe we reward their trust with honest and clear guidance, as well as an appreciation for timing, value and costs. Our clients appreciate the fact that no matter what the problem, we offer guidance to removing doubt and resolving conflict. We love to fight for just causes and we pride ourselves on not only winning, but always being able to exceed our client’s expectations in the results. No matter what the problem, we offer guidance to removing doubt and resolving conflict. We love to fight for just causes and we pride ourselves on not only winning, but always being able to exceed our client’s expectations in the results. Our customer records speak for itself and we are very proud of the many positive, real life testimonials that we have received from our clients. It is our pride in our reputation that inspire us to always work hard and in the best interests of our clients. please feel free to contact us for an obligation-free consultation to see what we can do for you.